On Saturday morning ATZ tweeted: Hope to see some KAP – Kite Aerial Photography – of Coney Island from this weekend’s Kite Flying Festival! We got our wish: flickr member “Ron’s KAP” uploaded this splendid aerial view of Coney’s amusement area from West 12th Street to West 10th. 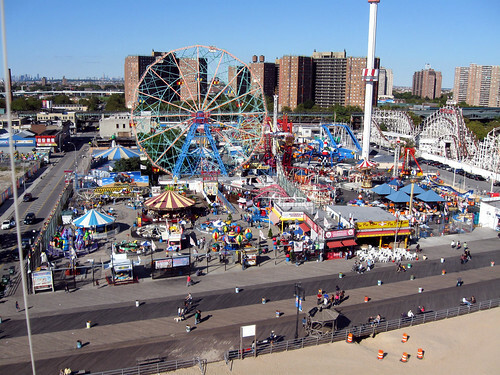 You can see Deno’s Wonder Wheel Park, the new Luna Park, and the Cyclone Roller Coaster. We have a total of 59 rides now in Coney, including 19 in the new park. The rides of 12th Street Amusements and McCullough’s Kiddie Park can also be seen on 12th St. Which one of these elegant rigs did Ron’s KAP send into the sky over Coney? Perhaps he’ll return tomorrow and show us! Sunday’s forecast: Breezy with highs in the mid 60s. Northeast winds 15 to 20 mph. In the photo below, American Kitefliers Association (AKA) members can be seen on the beach. Kite festival organizer Leucio Parrella’s red kite is aloft on the right. The Kite Aerial Photography (KAP) pool on flickr has noteworthy aerial shots of Coney Island dating back to 2006, including shots of the Polar Bear Club. 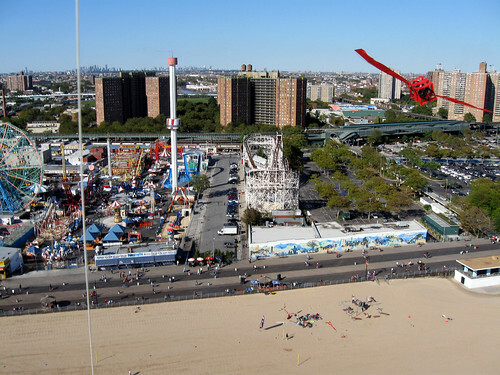 September 28, 2010: Go Fly A Kite at Coney Island’s 2nd Annual Kite Festival! !